How to make our spiced pumpkin scones inspired by Starbucks. 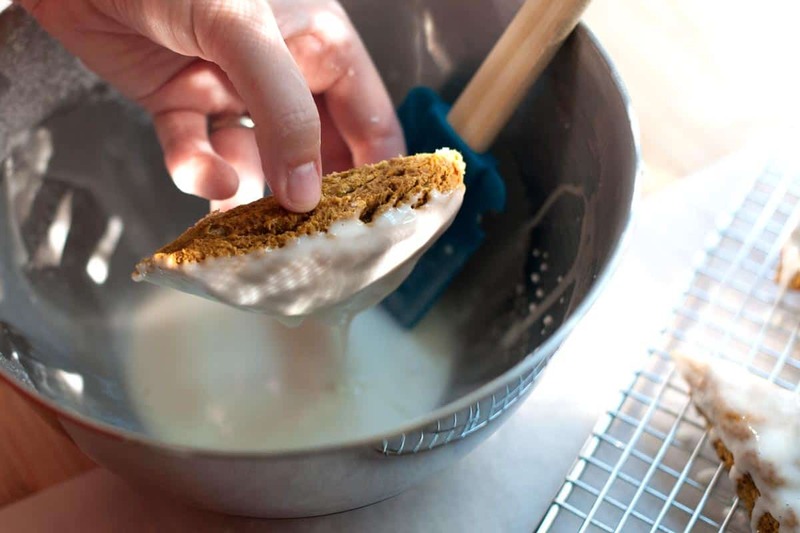 Jump to the Pumpkin Scones Recipe or watch our quick recipe video showing you how we make them. These always get rave reviews! These pumpkin scones are the best. We just love them. We add lots of pumpkin and fall spices to the dough and they have not one, but two glazes. One is a simple white glaze and the other, a pumpkin spice glaze that gets drizzled on top. 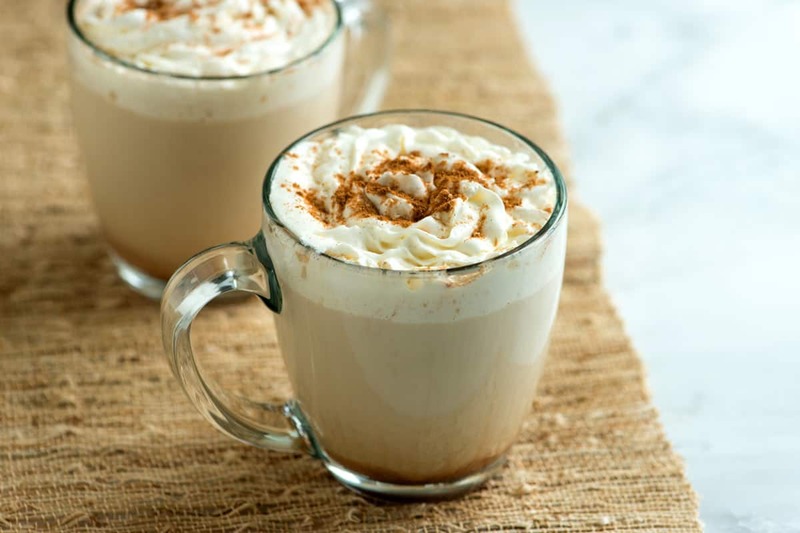 YOU MAY ALSO LIKE: Our copycat Pumpkin Spiced Latte recipe. It’s inspired by Starbucks (just like these scones). Once you make it at home, you’ll never go back. These scones are easy to make and worth the effort (they are so delicious). The scones are fantastic warm and at room temperature. You can make them with or without the glazes — we like both options. Before we get to the glaze, let’s talk about how to make the best scones. The trick to making the best scones is cold butter — if it isn’t cold, you’re done before you even get started. It’s the cold bits of butter in scones that makes them tender. 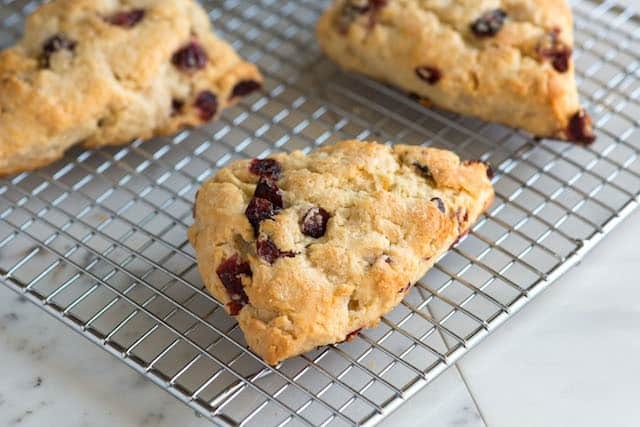 YOU MAY ALSO LIKE: These Cranberry Scones are packed with dried cranberries and orange zest and come together in minutes. Try them soon. It’s also important to not overwork the dough — the same goes for biscuits. To make the scones, we combine dry ingredients with lots of fall spices. Then we “cut” in cold butter. Do this by hand or by pulsing everything in a food processor. When it resembles coarse crumbs, add the wet ingredients. This is where the pumpkin puree comes in. When mixed, you’ve got your dough. Pat it into a rectangle and then cut into whatever shape you like — we go for triangles. 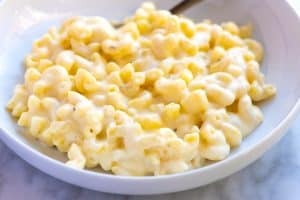 By the way, do you see all those specks of butter? That’s what makes these rise, tender, and delicious! After baking, you can glaze them. I mentioned above that you could actually leave these plain. You could also just use one glaze. If you’re going for it, though, both glazes are perfection. Highly recommended. The first glaze is simple — just half and half and powdered sugar. The second starts the same, but we also add pumpkin puree and extra spices. Once glazed, you’re done! Grab a cup of coffee and enjoy. For more ways to use pumpkin, check out our Easy Pumpkin Cupcakes from Scratch, our Chocolate Orange Pumpkin Bread (it’s utterly delicious), these Easy, Homemade Pumpkin Pancakes and our incredibly popular Pumpkin Pie. 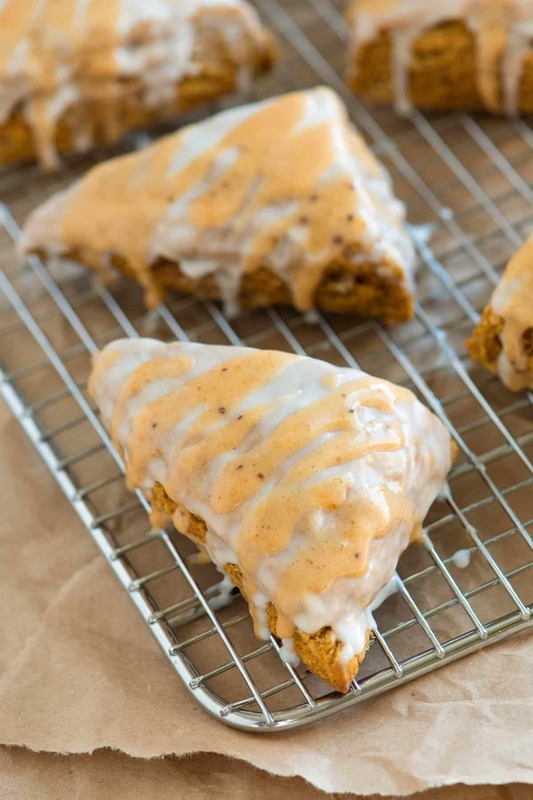 The inspiration for this pumpkin scones recipe was a popular treat from Starbucks! I know it looks like a lot of ingredients, but trust us, the recipe is easy to make. There are two glazes shared below. The scones are delicious with both, but you could use one or leave the scones plain. We’ve had them all three ways and loved them all. Center a rack in the middle of the oven and heat oven to 400ºF. Line a baking sheet with parchment paper. Or use non-stick cooking spray. Whisk the flour, sugar, baking powder, baking soda, salt, cinnamon, ginger, cloves and nutmeg together until blended. Cut the butter into small cubes then scatter over the flour mixture. Use two knives or a pastry cutter to “cut” the butter into the flour until the mixture resembles coarse cornmeal with a few pea-sized bits of butter, about 5 minutes. (You could also use a food processor for this – if using, add flour mixture to the bowl of a food processor, add the cold butter cubes. Then pulse three to four times until the mixture looks like coarse cornmeal or crumbs). In a separate bowl, whisk the pumpkin puree, molasses, half and half, egg and vanilla extract until blended. Stir the pumpkin mixture into the flour and butter mixture until a soft dough forms. 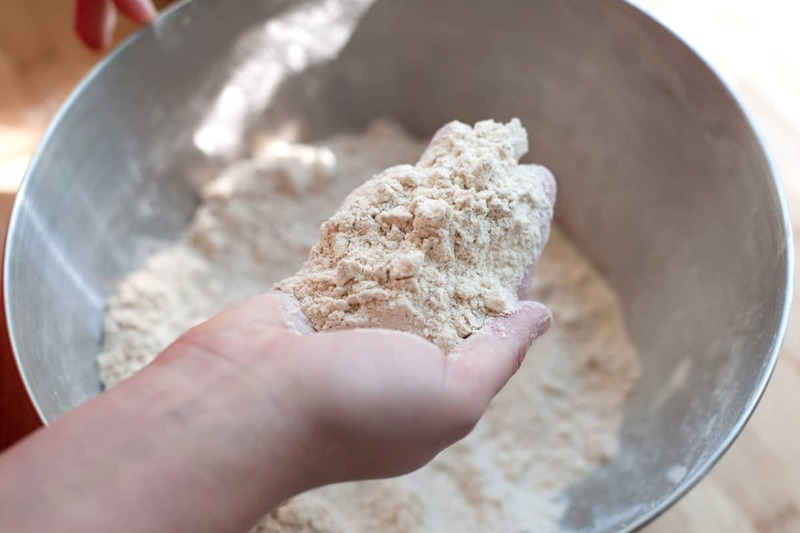 Transfer the dough to a floured surface. Knead three to four times until it comes together. Pat the dough into a 10-inch by 7-inch rectangle (a rolling pin can be used here). Cut the rectangle in half lengthwise then cut into 4 even pieces crosswise, making eight rectangles. 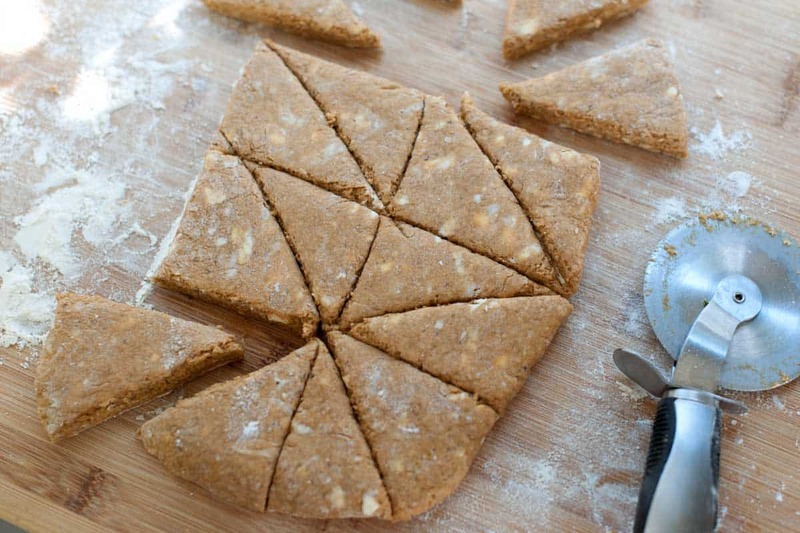 Cut each rectangle into two triangles, making 16 scones. Transfer scones to the baking sheet then bake 10 to 15 minutes or until golden brown and a toothpick inserted into the middle comes out clean. Transfer to a wire rack and cool completely. For the simple sugar glaze, add the sugar to a medium bowl then add one tablespoon of half and half. Stir then judge the consistency. If when you pick a spoon up and out of the glaze it slowly drizzles back into the glaze, it is fine. If it is too thick, add a little more half and half (a little goes a long way, here). If it is too thin, add a little more powdered sugar. In another bowl, make the pumpkin spice glaze. Combine the sugar, pumpkin puree, spices then add one tablespoon of half and half. Stir and check consistency. Adjust the same way as you would the simple glaze. Dip each cooled scone directly into the simple sugar glaze then place glazed side up back onto the cooling rack. 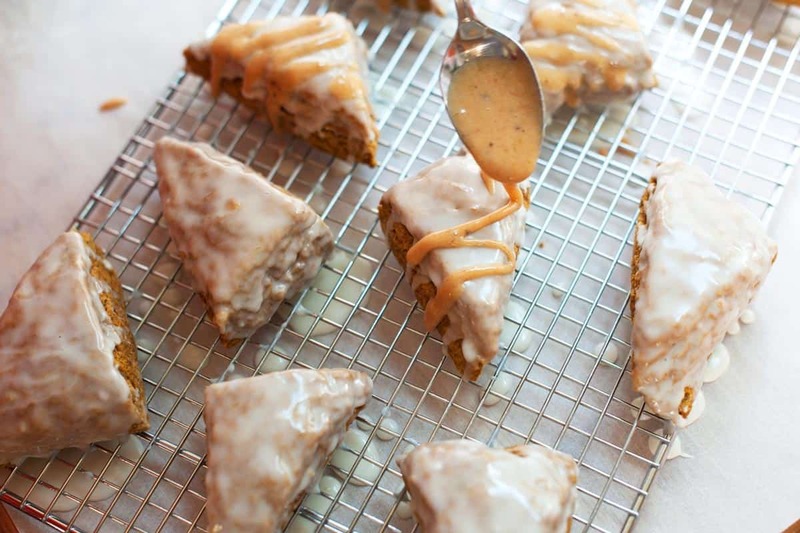 Use a spoon to drizzle a zigzag pattern of the pumpkin spice glaze across each scone. Wait 15 minutes or until the glaze has set then enjoy! Store baked and glazed scones covered with plastic wrap. We recommend storing in the refrigerator if storing them for more than a day. They will lose a little moisture, but will still taste great. Molasses: This adds a backbone to the flavor of these scones. If you do not have any and do not wish to buy a whole bottle for 1 tablespoon, you can leave it out. The scones are still delicious without it. Make Ahead Tip: You can freeze unbaked scone dough. Chill cut scones in the freezer until firm, and then transfer to resealable plastic bags. Keep up to a month. Bake in a 400ºF oven straight from the freezer. (They may take a few extra minutes). 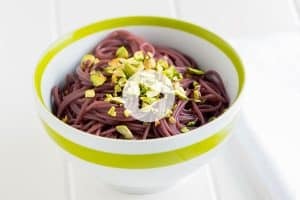 These look delicious (and easy)! Can’t wait to try them. These were absolutely delicious!! My kids practically inhaled them!! This is the second time I have made these. The twist is that I needed them to be sugar free. I substituted the sugar with Slenda Brown Sugar, sugar free maple syrup for the molasses,and added 2/3 cup raisins. The sugar content is much lower for us Diabetics and the taste is heavenly! So delicious. 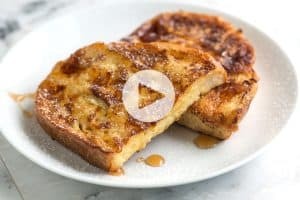 I tried other copycat recipes and NONE compared to this recipe! Molasses is definitely a secret ingredient for the wonderful dark color of the dough and extra flavor. My entire family enjoyed them. Saved it and will be using it many more times. These were great with a cream cheese frosting. My teenager have me the biggest hug! These are seriously good! I have made them several times. I add a 1/4 of cardamom and use half olive oil. YUMMY!!! Best scones ever, add pumpkin and they are magnificant and so easy to make. Amazing scones. Can the dough be made overnight and kept in the fridge and baked in the morning? I did this without thinking but it turned out great! Thank you for sharing the recipe. Everyone enjoyed it. I substituted maple syrup instead of molasses. I made these with chopped pecans and walnuts and chose to eat them plain, sans icing. That is how delicious they are! Definitely my new go-to recipe for pumpkin scones! Me family like pecans so substituted pecans for the nuts. I then only used the pumpkin spice glaze on the end of the scone and rolled in finely chopped pecans! BEST PUMPKIN SCONE RECIPE! AND BOTH GLAZES ARE A MUST! they really add to the overall flavor. This is an awesome pumpkin scone recipe. No joke! The rating goes beyond any scones recipe ever. It has my 5 stars plus another 10! Made these today and they are delicious! I didn’t have enough powdered sugar to do both glazes so I only used the basic one. Very good. I’m sure I will make them again! Thanks for this delicious recipe! Better than Starbucks and cheaper too. 🙂 As a bonus, I can eat them in my PJs. I added an extra tablespoon of molasses since I was out of brown sugar and subbed white. Love the texture and the spiced glaze. Not the texture or consistency of a scone at all. Way too “cakey” or bread-like. I used self-rising flour and left out the baking powder/soda and salt. I also substituted half the butter for lard. The dough turned out really sticky and I had to add an additional 1/3 cup of flour or so to make it manageable. After all that, they turned out great. Perhaps a bit softer and lighter than I would expect from a scone, but still very good. What could I use instead of heavy cream? Evaporated milk? Hi Polly, You should be able to use regular or evaporated milk (or even a fruit juice like orange). Condensed milk will be sweeter (probably too sweet). So I experimented with making these today and ran into many “hiccups” along the way – none that have to do with the actual recipe or instructions. However, I would do it all over again because these are SO GOOD! I followed the recipe exactly (after 2 trips to the store because silly me bought a wrong ingredient. Also, it took me over a half hour to find molasses at my local grocery store… I passed it three times before my eyes decided to see it.) Anyway, point being… make these. I added home made cinnamon chips to the dough which added a nice texture as well. Due to the over all sweetness (and my husband’s lack of sweet tooth) I left them unglazed for the time being. They are amazing. Thank you so much for the recipe! Great recipe! These really hit the spot. I did find that I needed to work in at least another 1/4 – 1/2 cup of flour to make it workable, but I was using fresh flour that was pretty fluffy still. I would also cut back a bit on the cloves in the pumpkin icing because I find it a bit stronger than I like. 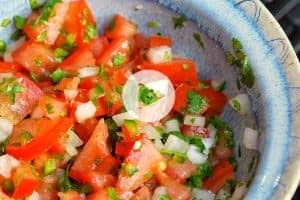 But overall a great recipe, quick to make and my family and friends that have tried it are all in love and have asked for the link to the recipe. These are amazing. We had these for the first time at Starbucks in Squamish two years ago on our way back to NZ from Europe and after coming home I was desperate to find a recipe. I have made these several times and it takes us right back to the wonderful time we had in Canada. Tried your receipe today and they turned out awesome. They were a big hit only lasted a day. It is a keeper for sure. Thank you for sharing.